discordia: YarnLove: Cozy Slippers, Funky Luna Lovegood Style! 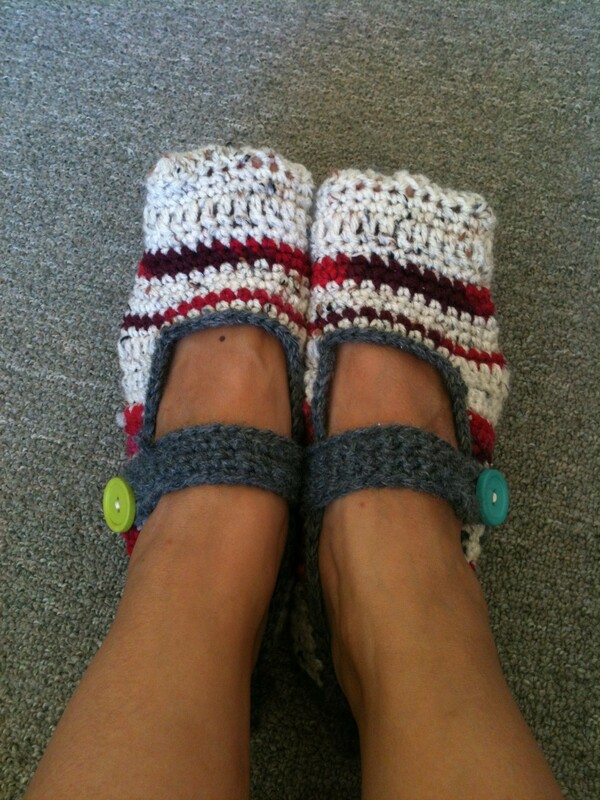 YarnLove: Cozy Slippers, Funky Luna Lovegood Style! On my very last day of summer before I begin a crazy work schedule that has me doing 7 days, 56 hours per week (it's true, and it starts tomorrow), I decided to spend my time re-reading Harry Potter and the Deathly Hallows and crocheting - hoping to make a dent in my embarrassingly large collection of random yarn. I manage this with a digital copy of the book on my lap top next to me, my cat at the foot of my bed, some iced tea on my night stand next to my crochet hooks, and lots and lots of yarn everywhere (mostly the cat's fault). So the reason I have so much yarn is that I'm a little derp, and whenever I start a project, I get all into it and really excited, and then something distracts me and I leave the project just barely started in my yarn basket for months until I come back to it and have forgotten what it was I intended to make. This time, then, I decided to start a project I could reasonably (for me) finish in an afternoon and would be really compelled to complete (as in I get a cool thing out of this when it's done). It also has to be something I haven't made before because then I'll just go into automatic mode and lose interest really fast (I couldn't tell you how many random colored Sack Boy doll heads I have lying around the apartment from every time I wanted to make a new Sack Boy, it's kinda morbid, actually - like house elf heads decorating the Black family house in 12 Grimmauld place, yuck... HP distraction). Anyway, so I thought ooh, slippers! I know Caleb said he wants a pair of slippers, and I'd love to make a cute pair of ballerina flats, too. I flipped the windows on my computer to a browser and click click clicked over to Ravelry, where I get all my patterns I never actually make these days :) I found this pattern: Sweet Slipper Original by Sarah, which looked like just what I wanted, so I got to it while reading and thinking about what to make myself for dinner (because I'm a multi-tasking queen!). 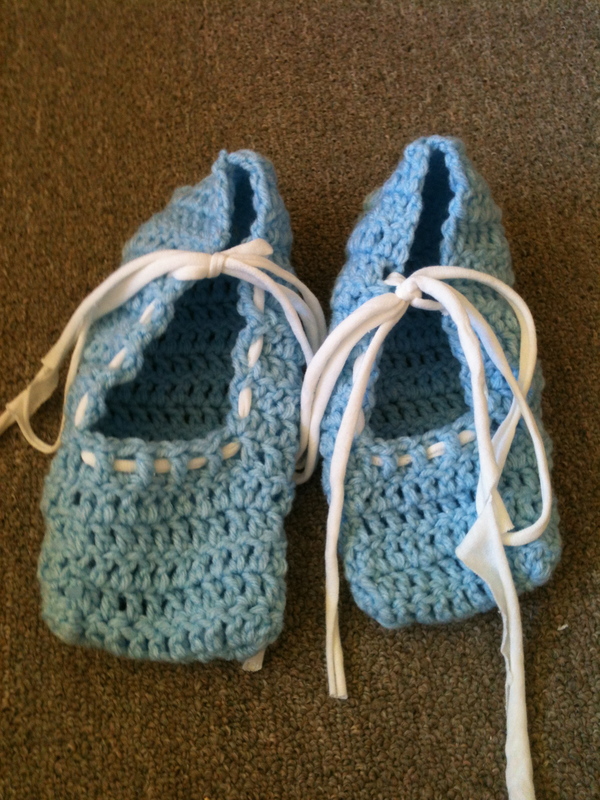 I decided to use my baby blue yarn and to make ballet shoe laces with t-shirt yarn I have lying around. They turned out... ok. Mine don't really look like Miss Sarah's in her pictures, mine look more like adult sized baby booties, which wasn't what I was really hoping for. This is definitely because I am not good at following patterns, however, because Sarah's look so cute. I decided to make up my own amendments for my slippers, and came up with a pattern that comes out more like Mary Jane slippers than ballet slippers. And since I am all about Luna Lovegood right now, I added just the tiniest bit of funky to them with mismatched colorful buttons. They are super cozy and way too warm for the summer heat we have up here in the PNW right now, but they will be so nice when our 8 months of winter come rolling in! Sarah's pattern is available through Ravelry with the link above, but you can also check out her blog (with lots of other great patterns and ideas): Sarah's Sweet Hearts. Begin: Chain 36 (or, measure how much chain you need to wrap around the top and the bottom of your foot while it's in the slipper, this can vary greatly depending on how high your instep is). Row 1: sc in the second chain from the end, 1 sc in each chain to the beginning chain. Chain 1, turn (36 sc, including the end) Rows 2 - 5: 1 sc in each sc, all the way to the end, chaining 1 and turning at the end of each row. (36 sc) At the end of row 5, chain 5 - 7 (depending on how big you want your button hole to be), slt to join with the very first chain so that the chain makes a loop. Chain 1, turn. 1 sc in each sc back over the loop to make the loop thicker (continue this until your loop is as thick as you want it, maybe not too thicker than 3 rows if you actually want to use it as a button hole). Attach the band to the slipper by stitching it in place. The best way, I found, is to put on the slipper and wrap the band around your foot to see where it feels the most comfortable. Use a darning needle and matching yarn to stitch on the band. Sew buttons of your choice onto the slipper right next to the non-looped end of the band. 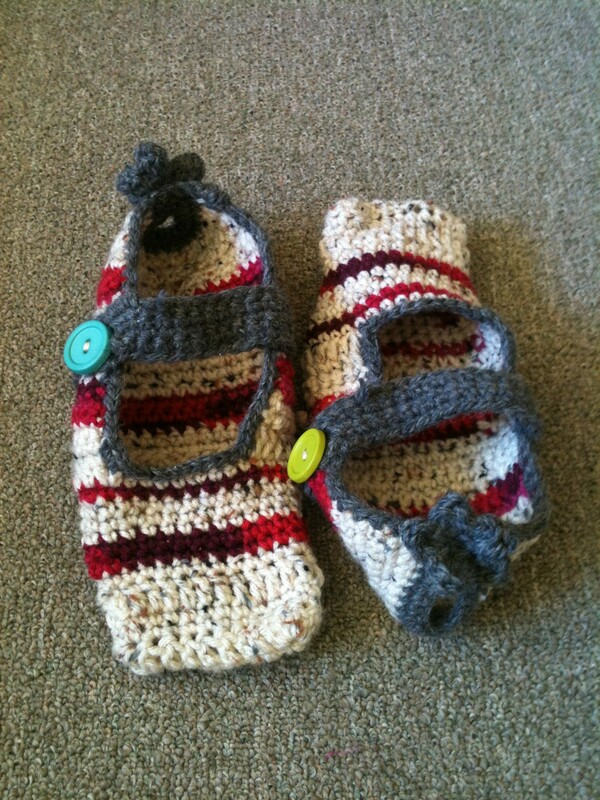 For a maryjane kind of slipper, the loop and the button can meet just on the outside of the foot. You can also stitch the whole band on the slipper, never mind the loop and button, and use it as a slip on... it is a slipper after all!